An Australian filmmaker has been sentenced by a Cambodian court to six years in prison on charges of spying for an unnamed country. 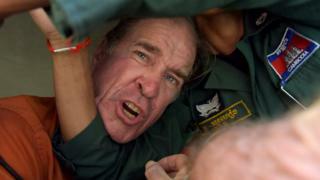 James Ricketson, 69, was arrested in June 2017 while flying a camera drone over an opposition rally. Ricketson denies the charges and his lawyer said he would appeal against the verdict. His arrest comes amid a wider crackdown on dissent by the increasingly authoritarian government in Phnom Penh. Ricketson has visited Cambodia frequently over the last 20 years and been a firm critic of long-term Prime Minister Hun Sen.
Local pro-government media had labelled the filmmaker as a spy acting to promote revolution, but Ricketson expressed only disbelief at the charge. "Which country was I conducting espionage for?" he said in court after the verdict was announced, Reuters news agency reports. "The Phnom Penh Municipal Court has decided to convict James Ricketson and sentences him to six years in prison for espionage and collecting information that is harmful to the nation between December 2010 and June 2017," Judge Seng Leang said. During trial, the prosecution argued that Ricketson's work had damaged Cambodia's reputation on the world stage. The prosecution's main argument relied on several emails in which he expressed sympathy for opposition groups. In one email, he urged Australia's government to withdraw an invitation for Hun Sen in 2016. The Cambodian courts make little pretence at being independent from political interference, and many will see this verdict in that light. James Ricketson has been an outspoken critic of the government of Hun Sen. In the past that was not a problem, when Cambodia enjoyed one of the freest media environments in South East Asia following the UN-supervised peace agreement of the early 1990s. But in recent years Hun Sen has become intolerant of criticism, accused of using the courts to lock up activists, and most recently, the main opposition leader Kem Sokha on a charge of colluding with the US to overthrow the government. Little evidence had been produced to back that charge, or the charge against Ricketson. But both men are still incarcerated, and are likely to remain in jail until they are no longer deemed a threat. With the main opposition party banned, Hun Sen easily won the most recent general election in July. His increasingly authoritarian rule has been widely condemned by western governments, but Cambodia no longer needs their aid as its economy is dominated by China. The veteran Prime Minister has shown leniency after that election victory, releasing some of his critics. It is possible he will do the same for James Ricketson before the end of his six-year sentence. His family has expressed dismay over the verdict stating: "James is not a spy. James loves Cambodia and the Cambodian people. He is a filmmaker and a humanitarian". The filmmaker's lawyer told media that if the verdict is upheld, the Australian government should take diplomatic action. The ruling comes as observers increasingly accuse Cambodia's government of authoritarian rule to suppress dissent. The opposition Cambodia National Rescue Party (CNRP) behind the rally Mr Ricketson was filming has since been banned, leaving the government without any serious political opponent. In this year's general election, Hun Sen's ruling party claimed a landslide victory, but it was a poll that was widely criticised for its failure to allow serious opposition. Hun Sen, a former soldier in the Khmer Rouge who later opposed them, has presided over a sustained period of rapid economic growth. But he has long been accused of using the courts and security forces to crush dissent and intimidate critics. In 1993, the UN tried to bring democracy to Cambodia. Is that dream dead?